The GraphUpdateScene component is really easy to use. 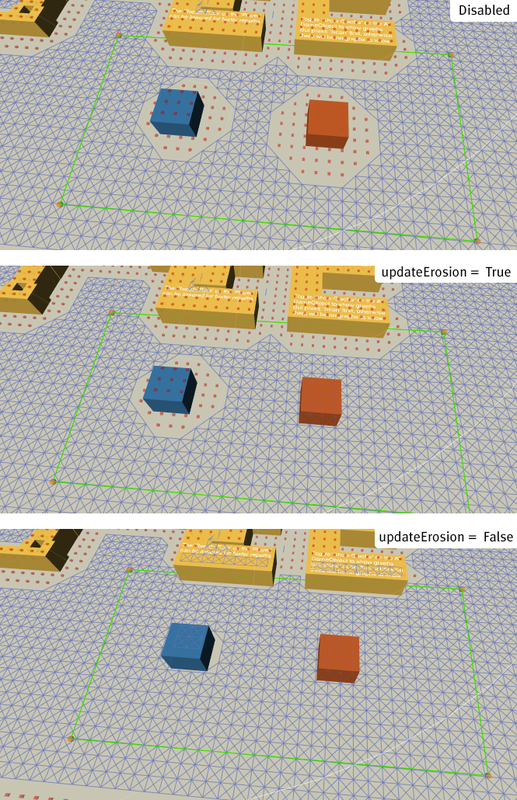 Create a new empty GameObject and add the component to it, it can be found in Components–>Pathfinding–>GraphUpdateScene. When you have added the component, you should see something like the image below. The region which the component will affect is defined by creating a polygon in the scene. If you make sure you have the Position tool enabled (top-left corner of the Unity window) you can shift+click in the scene view to add more points to the polygon. You can remove points using shift+alt+click. By clicking on the points you can bring up a positioning tool. You can also open the "points" array in the inspector to set each point's coordinates manually. In the inspector there are a number of variables. The first one is named "Convex", it sets if the convex hull of the points should be calculated or if the polygon should be used as-is. Using the convex hull is faster when applying the changes to the graph, but with a non-convex polygon you can specify more complicated areas. The next two variables, called "Apply On Start" and "Apply On Scan" determine when to apply the changes. If the object is in the scene from the beginning, both can be left on, it doesn't matter since the graph is also scanned at start. However if you instantiate it later in the game, you can make it apply it's setting directly, or wait until the next scan (if any). If the graph is rescanned, all GraphUpdateScene components which have the Apply On Scan variable toggled will apply their settings again to the graph since rescanning clears all previous changes. 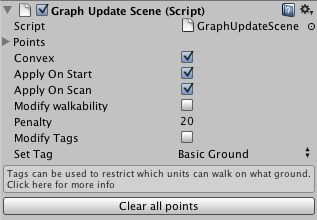 The above code will make it apply its changes to the graph (assuming a GraphUpdateScene component is attached to the same GameObject). Next there is "Modify Walkability" and "Set Walkability" (which appears when "Modify Walkability" is toggled). If Modify Walkability is set, then all nodes inside the area will either be set to walkable or unwalkable depending on the value of the "Set Walkability" variable. Penalty can also be applied to the nodes. A higher penalty (aka weight) makes the nodes harder to traverse so it will try to avoid those areas. The tagging variables can be read more about on this page: Working with tags. The Y (up) axis of the transform that this component is attached to should be in the same direction as the up direction of the graph. So if you for example have a grid in the XY plane then the transform should have the rotation (-90,0,0). Updates graphs with a created GUO. Creates a Pathfinding.GraphUpdateObject with a Pathfinding.GraphUpdateShape representing the polygon of this object and update all graphs using AstarPath.UpdateGraphs. This will not update graphs immediately. See AstarPath.UpdateGraph for more info. Disables legacy mode if it is enabled. Legacy mode is automatically enabled for components when upgrading from an earlier version than 3.8.6. Calculates the bounds for this component. This is a relatively expensive operation, it needs to go through all points and run matrix multiplications. Inverts all invertable settings for this GUS. Namely: penalty delta, walkability, tags. Penalty delta will be changed to negative penalty delta. setTag will be stored in a private variable, and the new value will be 0. When calling this function again, the saved value will be the new value. Calling this function an even number of times without changing any settings in between will be identical to no change in settings. Will not do anything if convex is disabled. Do some stuff at start. Apply this graph update object whenever a graph is rescanned. Apply this graph update object on start. Use the convex hull of the points instead of the original polygon. Emulates behavior from before version 4.0. Minumum height of the bounds of the resulting Graph Update Object. Useful when all points are laid out on a plane but you still need a bounds with a height greater than zero since a zero height graph update object would usually result in no nodes being updated. Should the tags of the nodes be modified. If true, then all affected nodes will be made walkable or unwalkable according to setWalkability. Penalty to add to nodes. Usually you need quite large values, at least 1000-10000. A higher penalty means that agents will try to avoid those nodes more. Be careful when setting negative values since if a node gets a negative penalty it will underflow and instead get really large. In most cases a warning will be logged if that happens. Working with tags for another way of applying penalties. Points which define the region to update. Reset penalties to their initial values when updating grid graphs and updatePhysics is true. If you want to keep old penalties even when you update the graph you may want to disable this option. The images below shows two overlapping graph update objects, the right one happened to be applied before the left one. They both have updatePhysics = true and are set to increase the penalty of the nodes by some amount. The first image shows the result when resetPenaltyOnPhysics is false. Both penalties are added correctly. This second image shows when resetPenaltyOnPhysics is set to true. The first GUO is applied correctly, but then the second one (the left one) is applied and during its updating, it resets the penalties first and then adds penalty to the nodes. The result is that the penalties from both GUOs are not added together. The green patch in at the border is there because physics recalculation (recalculation of the position of the node, checking for obstacles etc.) affects a slightly larger area than the original GUO bounds because of the Grid Graph -> Collision Testing -> Diameter setting (it is enlarged by that value). So some extra nodes have their penalties reset. If modifyTag is enabled, set all nodes' tags to this value. Nodes will be made walkable or unwalkable according to this value if modifyWalkability is true. When enabled, erosion will be recalculated for grid graphs after the GUO has been applied. In the below image you can see the different effects you can get with the different values. The first image shows the graph when no GUO has been applied. The blue box is not identified as an obstacle by the graph, the reason there are unwalkable nodes around it is because there is a height difference (nodes are placed on top of the box) so erosion will be applied (an erosion value of 2 is used in this graph). 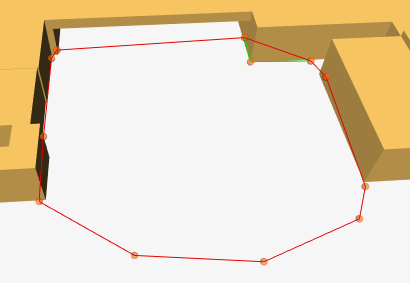 The orange box is identified as an obstacle, so the area of unwalkable nodes around it is a bit larger since both erosion and collision has made nodes unwalkable. The GUO used simply sets walkability to true, i.e making all nodes walkable. When updateErosion=True, the reason the blue box still has unwalkable nodes around it is because there is still a height difference so erosion will still be applied. The orange box on the other hand has no height difference and all nodes are set to walkable. When updateErosion=False, all nodes walkability are simply set to be walkable in this example. Update node's walkability and connectivity using physics functions. For grid graphs, this will update the node's position and walkability exactly like when doing a scan of the graph. If enabled for grid graphs, modifyWalkability will be ignored. For Point Graphs, this will recalculate all connections which passes through the bounds of the resulting Graph Update Object using raycasts (if enabled). Private cached convex hull of the points. Has apply been called yet. Use world space for coordinates. If true, the shape will not follow when moving around the transform. Private cached inversion of setTag. Lock all points to a specific Y value. Switches between using world space and using local space.